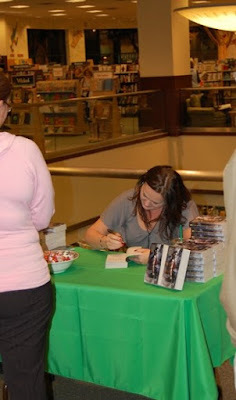 EDIT TO ADD: I'm also guest posting at Literary Escapism today, and giving away a signed copy of The Better Part of Darkness as well as the awesome Staked by J.F. Lewis. A little late with this, but what else is new, right? 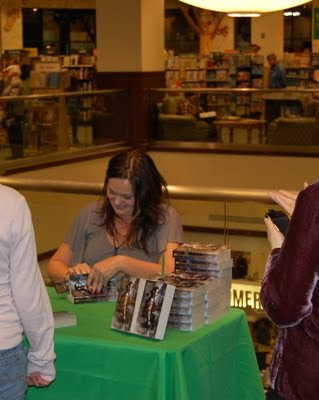 :-) So my first book signing, which took place Friday night at the fabulous Barnes & Noble at Southpoint Mall in Durham, NC. was awesome. I can't tell you how nervous I was, just hoping some people would show and the store wouldn't be left with a gazillion unsold books. My daughter and I drove to the store two hours early to met up with some friends. (And this was one time I wished I had a Blackberry or any phone that would've allowed me to get my email because my editor sent me something very special, and I was dying of curiosity!). We met our friends and ate dinner. Well, correction. They ate dinner. By the time we were seated, I only had enough time to order a sweet tea, and then it was off to the store where my critique partner and her hub were waiting for me. I had so much fun seeing my friends and family and meeting a few new folks. Cheri at the B&N was incredibly nice, and I'm looking forward to going back again sometime. And, when I got home, put on my jammies, and checked that email from my editor, I FREAKED out. Um, yeah. Saw my book 2 cover, and *sigh*. LOVE IT. Cannot wait to share it with you guys! Thank you for the great post & the pictures. I'm glad the signing went so well. And to have it topped off with your new cover must have the day even more special. Woot! Congrats on the great signing and on a fun new cover! Can't wait to see it! Thanks, Rob! Seeing my cover was truly icing on the cake! Kelly -- Hey, girl. OMG, I can't wait for you to see it. It's incredible, and I'm so happy with it! I just read and reviewed "The Better Part of Darkness" for Pocket Books SciFi/Fantasy Blog Tour Group. I loved the book. I will be looking for future books. Please keep up the good work. I liked the book so much, I posted my review on GoodReads, LibraryThing and Amazon. It won't go up on my blog, Pick of the Literate until the 17th.